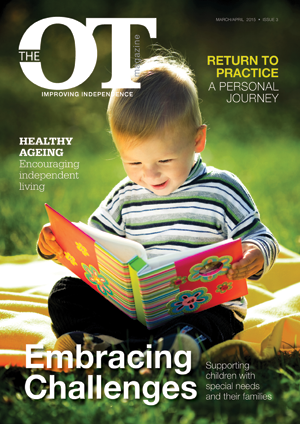 The March/April issue of The OT Magazine is out now! The latest issue is out now, sign up here to make sure you are on the mailing list to receive future copies! If you haven’t received a copy of the March/April issue simply email ros@2apublishing.co.uk with your address details and use ‘OT Mar/Apr’ as the subject. We will ensure a copy is sent out to you! This issue is packed with articles, products and columns from OTs. We have introduced an advice column for students by Dawn Fraser, Senior Lecturer Occupational Therapy at Teesside University and we have a vast range of products to help aid independent living for children and adults. We hear from an OT who works with Combat Stress, the Veteran’s mental health charity and we find out more about the vital work being done to support families with children with special needs by charity Embrace. We would love to hear your thoughts on the magazine, so please don’t hesitate to contact us at ros@2apublishing.co.uk with ideas for features or your thoughts on the magazine and let us know if you would like to see anything else on the pages of The OT Magazine.